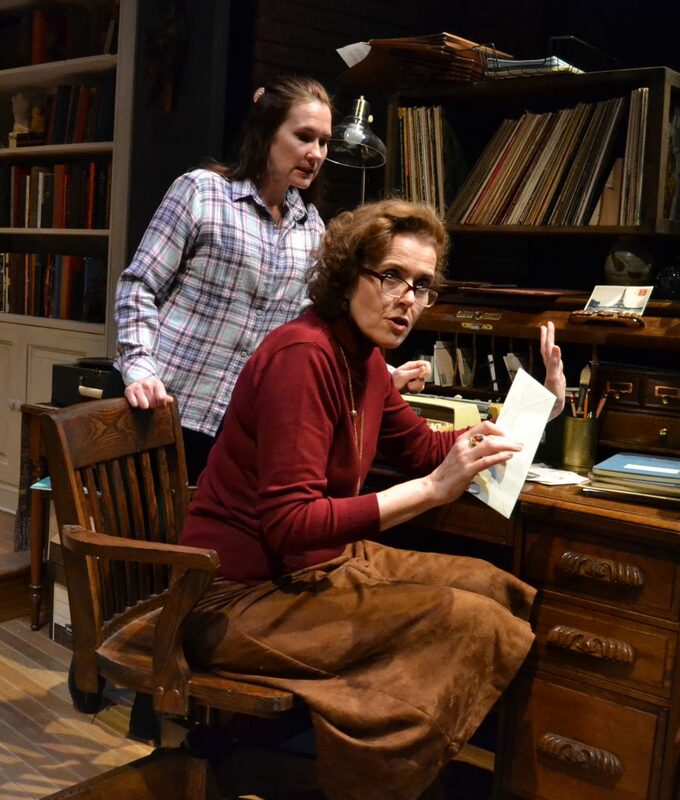 The symbiotic relationship between mentor and protégé — teacher and student —comes under the microscope in Donald Margulies’ cerebral two-character play, Collected Stories, now receiving a smart, impassioned production at Palm Beach Dramaworks. First performed in 1996, this tale of artistic and personal ethics has particular resonance these days with charges of plagiarism in the headlines, from First Lady Melania Trump’s convention speech to scuttled National Security Council communications director nominee Monica Crowley’s book passages. But Margulies — in his own example of co-opting from history — based his play on a real-life case of alleged plagiarism involving poet Stephen Spender and novelist David Leavitt. Switching genders, he gives us fictional short story author and writing teacher Ruth Steiner, who received critical acclaim early in her career, but never graduated to writing a novel. One fall day in 1990, a naïve, awkward but talented student of hers, Lisa Morrison, arrives as Ruth’s book-cluttered Greenwich Village apartment for a one-on-one tutorial. Intimidated by the imposing literary lioness, Lisa nevertheless worms her way into Ruth’s life as her personal assistant. Lisa hangs of Ruth’s every word, soaking up enough knowledge to earn her own success with a collection of short stories, anointed as a “brave new voice” to be reckoned with by The New York Times. Lisa’s trepidation over reading the review must surely reflect Margulies’ own ambivalence towards criticism of his work. One day, four years into their relationship, Ruth shares her intimate memories of an encounter and subsequent love affair with the troubled poet Delmore Schwartz. Lisa adopts Ruth’s story and uses it as the basis for her first novel, for which Ruth later berates her, calling it a betrayal of trust if not out-and-out thievery. All of this could be a dry case study in intellectual property law if Margulies had not infused the tale with such rich, dimensional characters and Palm Beach Dramaworks had not found such skilled actresses to bring them to life. That is particularly the case with Anne-Marie Cusson as Ruth. Impressive throughout, she rises to fulfill the character’s two bravura scenes at the end of each act — her heartfelt recollections of Schwartz and her lashing out at Lisa over the perceived duplicity. If, by comparison, Keira Keeley (Lisa) comes off as consciously acting while Cusson appears to simply become Ruth, that distinction is all but inevitable from the writing. For Lisa must change drastically from ill-at-ease grad student to sophisticated author, a transition that is difficult to make seamlessly. Still, Keeley grows into the role with increasing assurance, and by the final scene is sparring with Cusson on an equal footing. Paul Stancato moves capably into the director’s seat at Dramaworks, after assisting on Long Day’s Journey into Night. He has several choreography credits on Broadway and national tours and clearly understands that Collected Stories is a dance duet of shifting stances and temperaments. He is aided considerably by K. April Soroko’s scenic design, a lived-in, believably cluttered apartment, lit expertly by Ron Burns, who delineates seasons and times of day, as well as dramatic moods. Credit also goes to resident costume designer Brian O’Keefe, who charts the up-and-down fortunes of the characters through their wardrobes. In that sense, Collected Stories may bring to mind the Oscar-winning film All About Eve, a similarity that playwright Margulies grudgingly concedes. But his play is more ambitious, plumbing the nature of art and the artist’s responsibility to the truth despite the collateral damage. Such heady issues might have come across as dry if Margulies had not made his tale so entertaining as well. COLLECTED STORIES, Palm Beach Dramaworks, 201 Clematis St., West Palm Beach. Through Sunday, March 5. $66. Call: 561-514-4042.